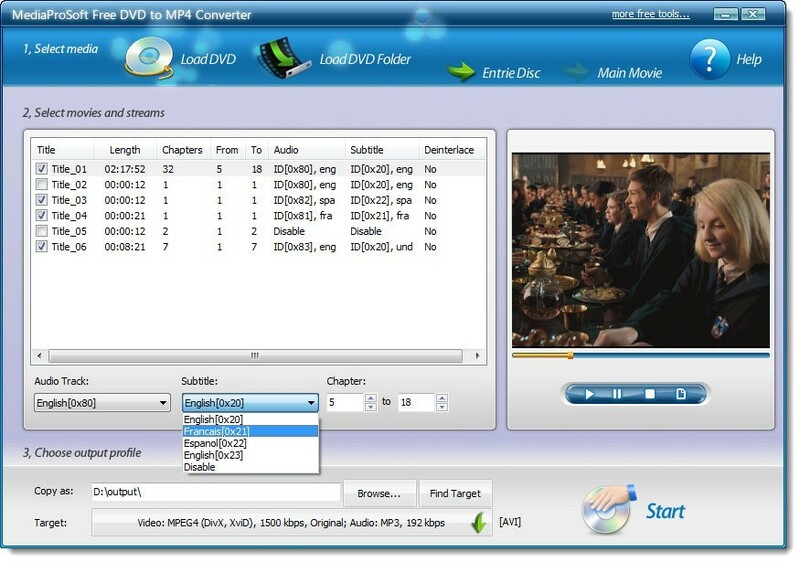 Looking for a smart way to convert your favorite DVD movie for playback on your MP4 player? With MediaProSoft Free DVD to MP4 Converter, you can get things done! The possibilities are endless as it also allows you to convert DVD video between many popular formats and extract audios from DVDs with incredible speed. Within clicks, you will need no more discs to enjoy in your journey! MediaProSoft Free DVD to MP4 Converter helps you convert DVD movie & MTVs to MP4 format for popular devices like iPod, iPad, iPhone, PSP and many mobile phones. It support various output formats playable on many portable devices like iPod, iPhone, PSP and other mobile phones. No matter which device you have, it provides the best configuration. It extracts audio tracks from all kinds of DVDs as audio extractor and save them to WAV, MP3, WMA, OGG, AAC, etc. Rip HD/Blu-Ray DVD to many video formats with lossless output to enjoy in media player with high-resolution screen. A window is provided on the right to play the whole DVD or the selected title. With the buttons "Play", "Pause" and "Stop", you can easily view the entire disc and decide which part to rip. The "Snapshoot" button helps you take a snapshot of the scene displayed in the preview window and save it as BMP or JPEG format. For multilanguage DVD discs, you can specify the ripping settings of both audio and subtitle in different languages. You can also disable the audio/subtitle ripping. You don't need to be an expert to get the quality you want as it also provides many well-configured quality presets for every output format to meet your professional or casual needs. Conversion without any temporary files for high converting speed and economy of hard disk resource - multicore processors are supported. It checks your CPU type and ensures the full use of your CPU to bring you the best ripping speed. Free DVD-Video Burner - Free DVD-Video Burner allows you to burn full movies as well as small clips in AVI, MPEG-1, MPEG-2 or WMV formats to DVD-R and DVD+R discs. It's a perfect DVD burner program for users of all levels. All Free DVD to MP4 Converter - The powerful DVD to MP4 converter enables you to convert DVD to MP4 and many other video formats, even the up-to-date H.264/MPEG-4 AVC and H.264/PSP AVC HD video formats. It realizes your dream of enjoying DVD in your MP4 players. SuperEZ Video Converter Free - A one-for-all solution to convert video files of MPEG, AVI, MP4, SWF, FLV, WMV, RMVB, ASF, MOV, 3GP, etc. into MP3, WAV, WMA, OGG AAC, M4A, FLAC and MP2 files. The program provides all commonly used presets to easily customize the output quality. Free Easy Video to GIF Converter - Free Easy Video to GIF Converter is an simple and quick video to GIF creator on Windows, capable of converting all popular formats of video to animated GIF images, lets you play video in GIF image.